Ideal for the maintenance of a healthy digestive system. 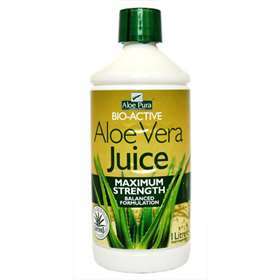 Aloe Vera is highly recommended supplement as a cleanser and revitaliser for a wide range of aliments. It soothes stomach upsets, cleans out the intestines and detoxifies the body as well as stimulating and supporting the immune system. Aloe Vera can also aid with the absorption of vitamins and minerals in your intestine. Contains 100% natural Aloe Vera, which includes the whole leaf and inner gel. No added sweeteners, flavours of thickeners. Certified in Mexico as naturally grown. Awarded The International Aloe Science Council seal of approval. Other Aloe Pura products available. As a liquid food supplement take 25ml, daily direct or diluted in fruit juice(can be taken twice daily if required). Shake well before use. Avoid use whilst pregnant or breast feeding. Aloe Vera is a natural product that may vary in taste, colour and consistency from batch to batch. This does not affect the potency or quality of the juice. Store in a cool, dry place refrigerate after opening and consume within two months. 100% natural Aloe Vera Juice, Antioxidant: Ascorbic Acid, Preservative: Potassium Sorbate.